This entry was posted on Tuesday, April 9th, 2019 at 9:07 am. Westbury Mayor Ian Cunningham (left) with Elvis and branch and Post Office staff about to open the branch. 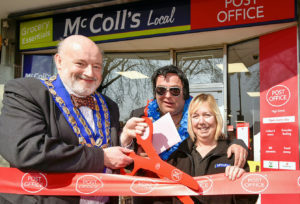 Westbury mayor, cllr Ian Cunningham, cut the ribbon on 29th March to officially open the new High Street Post Office at McColls retail group, in the High Street. There was a big community celebration to mark the official re-opening, restoring a Post Office to the town. Elvis impersonator, John Whitlam of the Elvis Experience, entertained customers. The previous branch closed in October 2017 when the Co-op store where it was based closed down before becoming Lidl. The new Post Office will be open seven days a week until 8pm every day. The opening hours are: Monday to Saturday: 6am – 8pm; and Sunday: 7am – 8pm. Dr Andrew Murrison MP, had been due to attend the official opening, however, MPs were unexpectedly required to attend Parliament for Brexit debates. Chief operating officer for McColl’s retail group, Dave Thomas said, “We are delighted to welcome Post Office customers to our store, which offers a wide range of Post Office services alongside our extensive retail offer. As a convenience store operator we are always looking for ways to make life easier for our customers and the additional Post Office services will be available for the full opening hours of the store, in order to provide an excellent service for the local community.